Save the Date! Tickets are now on sale. We already have many fabulous items for auction. Click here to browse our auction items. 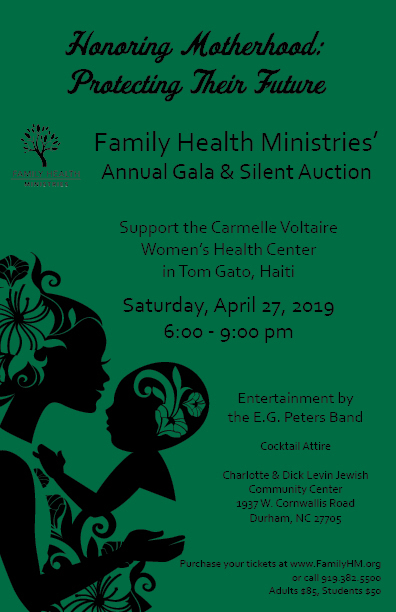 Join Family Health Ministries’ friends and family for a fun-filled evening of great food by Rocky Top Catering, music by the EG Peters Band, and electronic bidding on silent auction items. Proceeds from this event will benefit the Carmelle Voltaire Women’s Health Center in Tom Gato, Haiti. We are still looking for volunteers for this event. If you are interested in volunteering your time contact Kelly Dassow at kelly.dassow@familyhm.org.